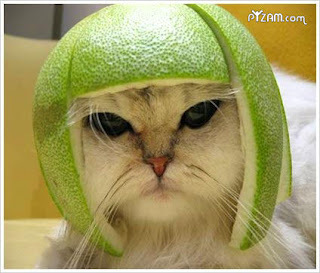 i iz trying to find perfect accessories to go to Fagin's purr-day party. i iz a little worried my black bag no goes wiff my brown floofs and furs. but then i hears now it is fashion-ubble to mixes black wiff brown..... plus i haz grey floofs too.... what do you thinks? can i pulls it off? Bunny, that's my bag. I was going to use it when I go to the movies later. Peanut Butter, No bites! Play nice or No purr-day party! And no Red Mouse. 1. i getted new bloggie! mommy made it all pretties for the day of love! 2. i had my first Big Kitty meow! mommy sez i normally make "ferret noises" and little cries but today i sez MEEEOOOOWWWW! 3. i losed red mouse FOUR TIMES! 4. i made mommy get red mouse four times....then she said no more. 6. i cuddled wiff mommy while she taked nappy. i thinks she getted sus-fish-us cuz i no doos that lots. 8. i letted her pet me and picks me up. again...i think she suspects what i iz doing. 9. i tries WHAPWHAPWHAP her till she gets it but that did not make her happy. 11. i looked super cute so mommy gives me bite of her brownie. 12. she sez no so i just steals it anyway. 14. i getted yummy stinky goodness and i helps mommy makes her dinner so she sees i iz good Top Chef kitty and will gives me a bite! 15. i sitted very quiet and stared at her wiff my laser eyes till she getted me red mouse again. now i go take nap cuz that remembering all that made me sleepies! WW: i heart shiny things! mommy FINALLY taked down the chrissy-mouse tree today. she haz been very very busy and no had time. i helped! but now i has no pretty tree to hide under and no pretty twinkles! I'm going to Dizzy World! this is dizzy world! doesn't it looks like the bestest kitty amusement park ever!!! i wantz to goes! who's coming wiff me? so i iz all alone today. mommy goed to a par-tay and no taked me. even though i haz pretty party dresses! she sez i gets to pick my own Doozy of a Commercial and shows you! iz tough. i love the horsey ones. and those talking babies sure makes me laugh. And there was a talking orange cat wiff birdies!!!! easy like Super Bowl Sunday! 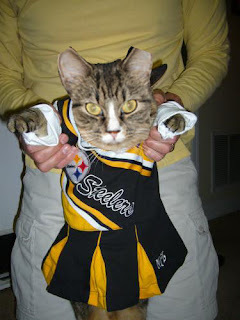 so mommy's friend sended her these pics wiff kitties all dressed up for the super bowl thingy. so i shows you. mommy also thought it would be funny to put me in the photos. 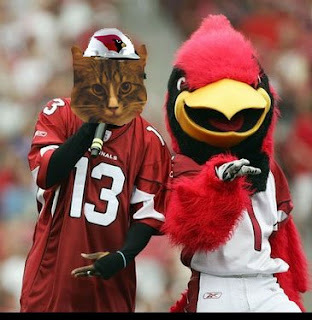 haz fun wiff the big game! i can'ts waits for the commercials! i loves those clydesdales ones. 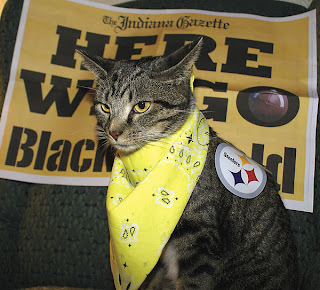 if yous likes football, mommy doos live updates on her other site today! or if you no nose football, she maked girl's guide to football 2.